The personalized Anniversary Ketubah surrounded with Roses, Sunflowers and Daisies with a delicate assortment of different shades brown leaves. The text written in brown complimenting the "Parchment" background and the overall design. and in the center the Star of David. 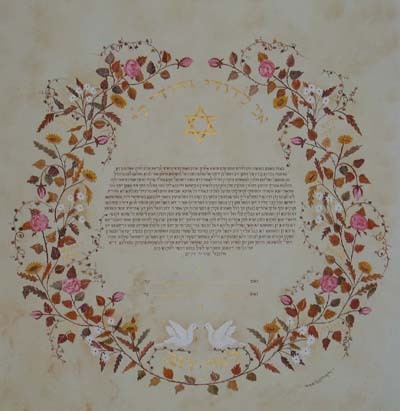 The names of the Bride and the Groom, and the two white Doves of Peace at the bottom.